"As we kept reviewing the game, it continued to look like a style of gaming, a much more linear game, that people don't like as much today as they did five years ago or 10 years ago." — EA CFO Blake Jorgensen, explaining why the publisher cancelled Visceral Games' Star Wars project and shut the studio down. QUOTE | "If you did a bunch of cosmetic things, you might start to violate the canon. Darth Vader in white probably doesn't make sense, versus in black. 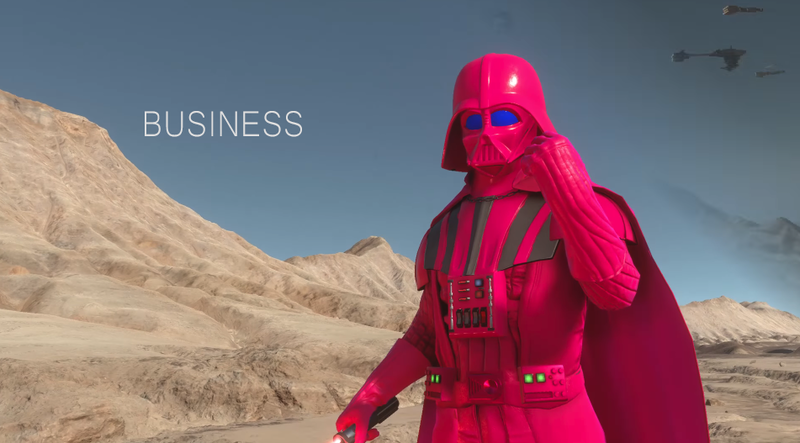 Not to mention you probably don't want Darth Vader in pink." — Jorgensen again, this time explaining why EA chose not to focus on a cosmetics-only approach to loot boxes in Star Wars Battlefront II. QUOTE | "This addiction is a personal failing of mine and the reason I can't in good conscience buy games that offer an loot crate, at all. This is a coping strategy that I use to keep away from the temptation of opening these crates." — Star Wars Battlefront II subreddit user Kensgold, in a letter asking Electronic Arts to consider the impact its game will have on conditioning children to enjoy gambling. QUOTE | "We've been on this path for 15 years with day-one DLC, subscription passes, pay-to-win. We as consumers kept accepting that, kept buying those games. Now we're at a place where we need to consider, do we need to legislate? Does the ESRB have to consider a new rating that could deal with gambling and addictive mechanics?" — Hawaii state representative Sean Quinlan says the industry needs to self-regulate loot box practices or risk government intervention. QUOTE | "We are concerned with the growth in examples where the line between video gaming and gambling is becoming increasingly blurred." — British Gambling Commission executive director Tim Miller details the government agency's stance on loot boxes and calls for "prompt and sincere" self-regulation from the industry. QUOTE | "I think over the long-term, it will be 100 per cent [digital]. I just can't predict whether that's five years, 10 years, or 20 years. It's probably less than 20 and maybe more than five, but I think it ultimately gets there." — Take-Two president Karl Slatoff predicts games on physical media will soon be a thing of the past. QUOTE | "I think it is inevitable where a line is crossed where the uncanny valley just goes away." — District 9 director Neill Blomkamp, who's making a series of short films in the Unity engine, computer-generated people will someday be indistinguishable from the real thing. QUOTE | "We're not just a game, and as long as we're talking about ourselves as just being a game, we're undermining ourselves and not allowing ourselves to be everything we can be." — Destiny: The Taken King writer Martin Korda wants game developers to set the bar higher when thinking about the stories their games tell. QUOTE | "In the case of Final Fantasy XV, I told the developers they should do what they thought was best, that there was no need for them to be overly conscious about what the Western developers do." — Square Enix CEO Yosuke Matsuda says during the last generation, the Japanese publisher was looking "to catch up" to Western studios, but switched strategies this generation. QUOTE | "It is with great sadness that we announce the closing of Gazillion Entertainment. As a result, we are no longer able to operate Marvel Heroes Omega until December 31 as originally planned. Instead, Marvel Heroes Omega will be sunset immediately on all platforms and will no longer be available as soon as this process is completed." — Gazillion Entertainment announces its own demise, pulling the plug on its franchise title earlier than expected. QUOTE | "We had as many Wii U backers of the game as Xbox and PlayStation combined." — Playtonic studio head Gavin Price talks about the breakdown of Kickstarter backers for the company's 3D platformer Yooka-Laylee. The studio cancelled the Wii U version due to technical issues, and is preparing for the Switch release later this month. Blake.......mate, you gotta stop talking like a PR rep buddy. I don’t understand why the CFO of a company would be talking specifically about a product in the way he does. Certainly the company I work at, the CFO would not be allowed to say boo about anything. I only came here to make this EXACT comment, haha. And why Battlefront 2 outsold Fallout 4 and Wolfenstien. Will EA be selling BF2 six years later like Skyrim? Uncharted and TLoU sold well because its Naughty Dog and you can actually count on them for a top tier linear experience. Everyone else, not so much. Literally every "This week in buisness" article is like this. Do some research next time bud. The purpose of this regular feature is to serve as an aggregator, highlighting choice cuts from an entire site of games industry news so that we don't have to. If you don't like aggregator/blogs, you should probably stop reading Kotaku, because that's pretty much the point of the site. Maaaaan, the day people stop making linear games is the day I stop gaming.